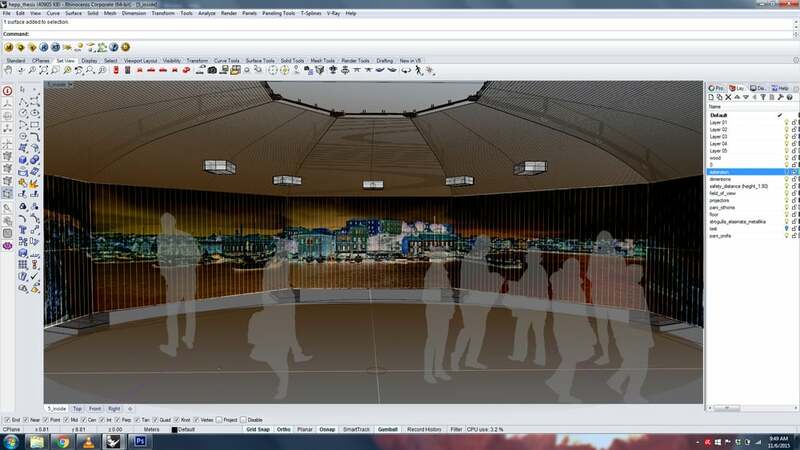 The Hybrid Environmental Projection Platform is currently being developed as a spatial augmented reality platform with integrated Information and Communication Technology (ICT) systems. 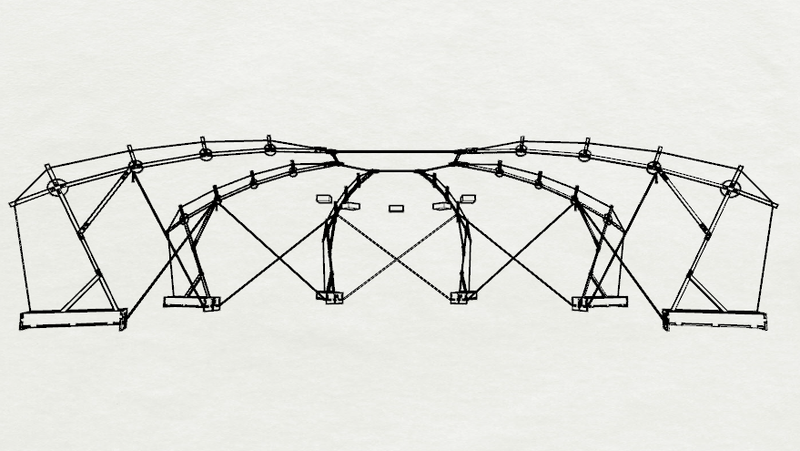 The platform was initially conceived as the technological infrastructure of the Automatic Kinetic Theatre project but it was developed as an independent multi-purpose platform. The operation of the platform is based on interactive systems, robotics and tele-presence systems that allow the immersive projection of cultural themes to and from diverse multilingual communities. The project aims at the creation of a transcultural network that will cooperatively develop tele-presence objects, inspired from those communities’ cultural heritage in order to enhance its efficient dissemination. Finally, the project aims to blur the notion of “here-there” as the platform aims to “teleport” the audience to diverse exterior and distant environments. To facilitate the cooperative development of virtual and actual cultural products, inspired by the cultural heritage of people and places. To promote multilingual networks that will support multimedia communication processes and globally communicate cultural heritage themes. To implement Information and Communication Technologies systems in the development of immersive environments within which the audience receives the cultural information through experience as it is transmitted through multimodal systems. To project elements that act as cultural ‘beacons’ globally, bringing people together, and, moreover, to project locally important features that every culture holds special individually in order to facilitate the process of creating the sense of a place. To support linguistic and cultural diversion. To support the operation of a multilingual cultural network between different countries, languages and scientific fields. To support the active interaction between regions for the development of new cultural objects and traditions, for example an emergent common European cultural heritage. Every CHeH must operate as an autonomous laboratory that produces new distinct cultural products in a projectable form. Every CHeH must be supported academically and technologically to fulfil its mission. CHeHs must be actively connected to support each other, exchange their products and further disseminate their work. The CHeH network will expand gradually, as social involvement will grow. 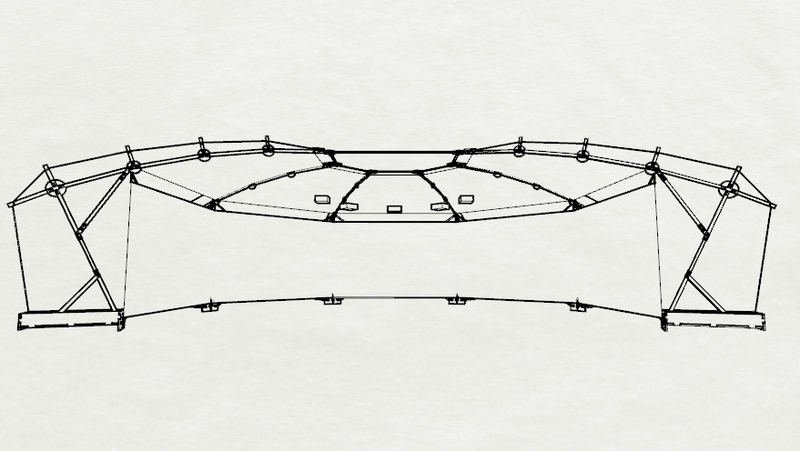 HEPP operates as an adaptable multi-functional artefact. The proposed trans-cultural projection platform creates a hybrid environment between virtual and actual reality, an in-between space with the ability of perceptual immersion and personalisation. It allows the simultaneous ‘presence’ in many places and times. The experience is formulated so as to present historic and cultural themes and projected to ‘surrounding’ audiences, who could be distributed around the world at the time of the projection, while experience the theme as nearly-being there. The audience experiences situations and environments that began in the past and have their influence projected through time to this day. In order to achieve that, a simple projection system would not be enough. A holistic experience is therefore directed with the adequate detail for the human brain to be immersed, as being in the projected place and time, living the theme. Scents, lighting, textures and a plethora of environmental characteristics participate in revealing the 'character' of a place and its cultural bearers, avoiding a stylised representation. The aim is to help the audience get immersed in the message and feel like participating in the cultural heritage of the projected place and event. 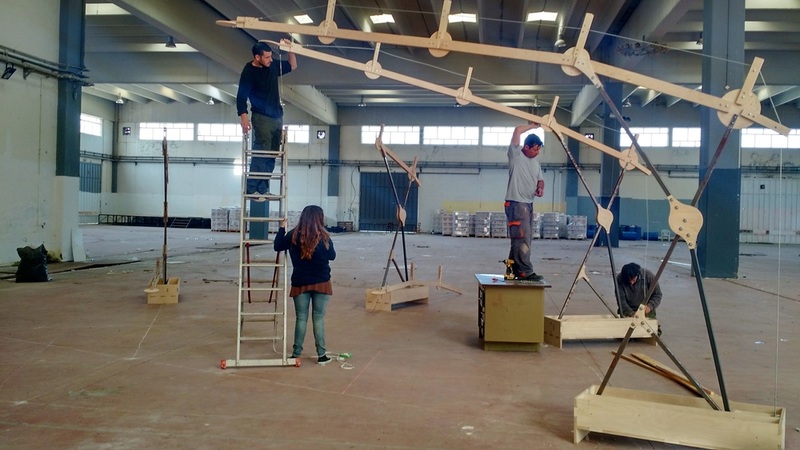 The whole installation is portable and unfolds to get assembled on location. The dimensions of the platform are such so as to fit normal rooms. Additionally, it can operate as an add-on infrastructure in larger rooms. It can be adjusted to fit inside classrooms and conference rooms as well as within halls and auditoriums. The system projects information by dividing it in two main categories; passive and active informational elements that address the spectrum of human perception. The division is directly linked with cognitive processes on how information is perceived and understood, and allows for the better comprehension of the cultural object. A general description would be that the passive layers project the environmental ambience or “sense of place”, while the active layers project the literate information, the main cultural theme. More specifically, there are 3 passive layers that provide the ‘depth’ of the experience. The last one (3rd passive layer) provides the general background and the overall sensation that a place projects, mostly light, color, sound, and maybe temperature, humidity and odours. The next one (2nd passive layer) provides referential/navigational points and landmarks that help the mind understand relative positions. The passive layer on the top (1st passive layer) projects information that, while not directly related to the theme, plays a significant role in the way it is perceived. In this layer, elements may change their status in the hierarchy and move from the 3rd active to the 1st passive, and vice-versa. The information in the passive layers is discreet, with slow changes. The 3 active layers include the informational elements that are higher in the perceptual hierarchy and project the main figures of the cultural object. The 3rd active layer includes the elements that affect the theme regarding the way it is related to the environment and to the «keywords» of the theme. The 2nd active layer supports the narration and understanding of the theme more significantly. Finally, the 1st active layer includes the main figures/features that project literate information around the theme (protagonists/leading elements). The system belongs to the category of cyber-physical objects and it involves embedded informational systems on spatial elements. Assemblies of sensors, controllers and actuators allow the HEPP’s operating system, or the «tele-director», to have knowledge of the conditions the installation operates into and control the behavior of the system’s elements accordingly. Specialized artificial intelligent algorithms and software are being developed specifically to assess the conditions of operation and provide ‘creative consulting’, through learning algorithms, and/or even interventions to maximize the impact of the platform’s goals. Furthermore, mobile applications can be developed to communicate with HEPP and its content, allowing for wider implementation and easier participation. HEPP can efficiently create an environmental setting with specific themes. 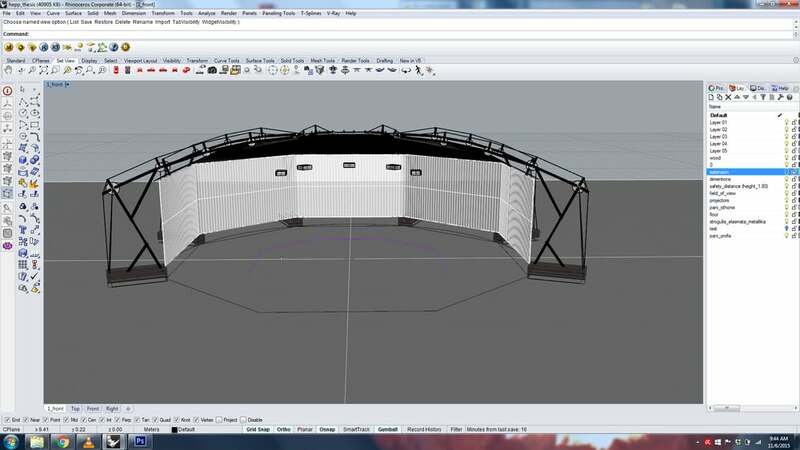 It operates beyond the screen, by employing robotic autonomous agents in the audience area that act as protagonists in specific settings and happenings. Furthermore, the system is designed to project not only images and sounds, but also odours, temperature and humidity, creating a far more engaging experience. People can also participate to augment the experience. Moreover, physical objects can be included. These objects can be blended in the scenery with projection mapping techniques and can be used by the audience. The mobililty and adaptability of HEPP allow it to be installed on specially designed vehicles, such as buses, and operate within specific confines, or to be transported in special packaging and be deployed rapidly on-site, creating small nodes of cultural-kiosks. 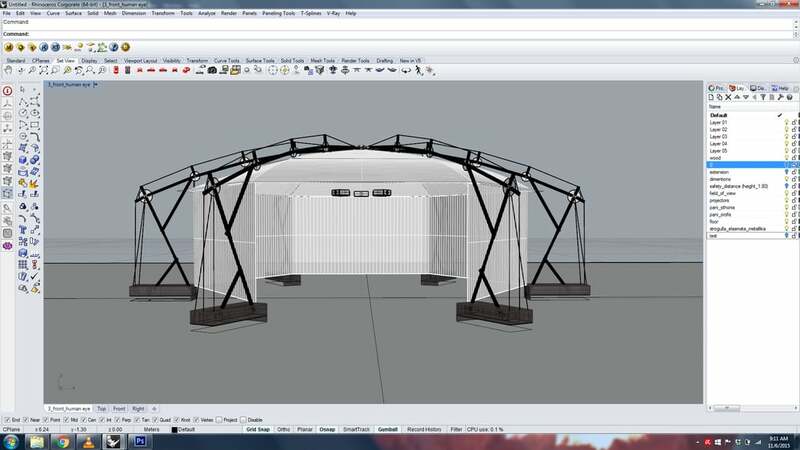 The deployable version can be easily installed in existing structures and fit exactly within each site appropriately. The modular nature of HEPP helps to easily fit smaller or bigger sites and create diverse experiences. - Expandable: one or two sides of the special vehicle open to expand the available space to create one bigger or more smaller spaces within the vehicle. Expansions can also create spaces in the exterior of the vehicle that can be utilised. - Specially retrofitted buses can connect to create a quite larger area/plaza for a great variety of culturally themed events. it projects dominant and ambient information (it gives special focus on peripheral background states in order to increase the sense of ‘place’). it is unobtrusive and user-friendly as it does not require anything from the audience (to wear or use special equipment) and any interaction requires only normal vocal or gestural behavior. Oungrinis, K.-A., Liapi, M., Christoulakis, M., Klothakis, A., Paterakis, I., Avarikioti, N., Dimopoulou, M., Cremlis, M., Koutsoumpas, D., and Sapountzi, D. (2014). 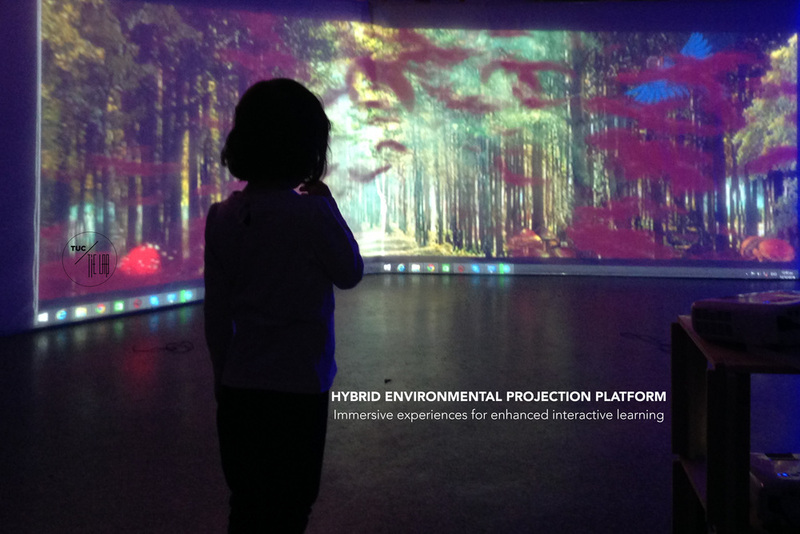 Hybrid Environmental Projection Platform: An interactive educational tool. In: K. Zreik (Ed.). Architecture, City and Information Design (EuropIA.14). Paris: Europia, 171-184.